I love LEMONS! Let me shout it from the roof tops, I LOVE LEMONS. I am not sure where my love affair began with lemons...as a kid, I would just eat them, skin and all (I know that's kinda gross today). But the fragrance of lemons just sends me to a superb place in my head! As I was thinking of words for my lemon love fantasy, I got tickled at myself, flawless, fantastic, supreme, perfect! Ok, so maybe that's a bit much but from the time I was little, I've been so drawn to them! Junior High was Love's Lemon Fresh perfume (or probably cheap cologne, but in my mind priceless perfume), then picking them from a tree in California that were too big for my hand and smelling the blossoms too.. to the mundane of lemon pledge! I love them all. They are medicinal, fragrant, and well, perfect! WOW has the best of the best of lemony gorgeousness right now! From the rich, dreamy, aged wall paper (see it behind the bed?) 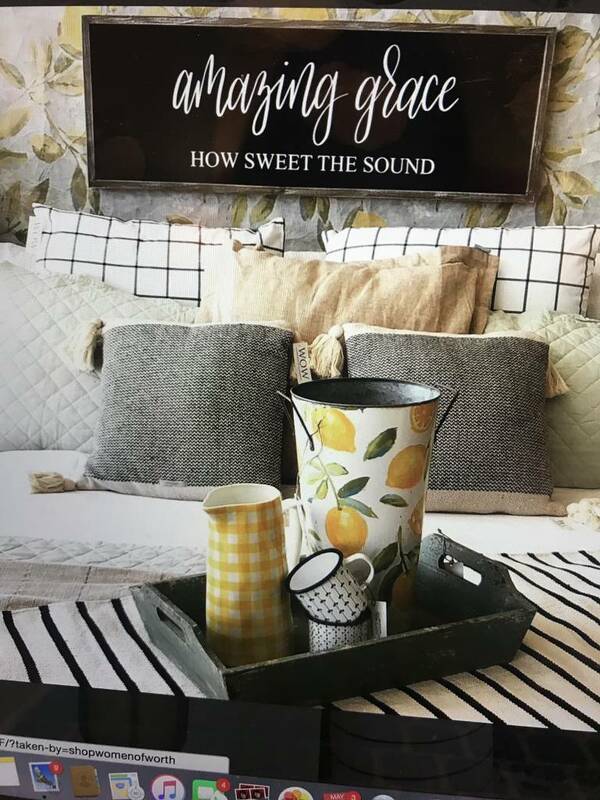 that you can layer over existing walls, or use in your own unique creative art form, to the tall lemon splashed metal bucket along with the delightful juice pitcher in bright yellow and white gingham! So I say, let's get "easy peasy lemon squeezey", and bring freshness into our homes! Now all I want is fresh lemonade! Oh! And did I mention the double dipped lemon pretzels? Hurry they are going FAST! We share that same feeling for the love of lemons-minus the peel!